Available in four different base finishes and 3 different frame colors. Collaborate and brainstorm without the hassle of manual adjustments on your chair with the Steelcase QiVi Collaboration Chair. 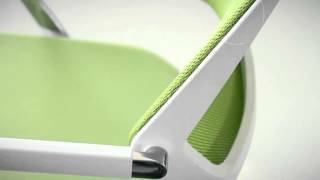 The QiVi Collaboration Chair by Steelcase is designed to encourage movement and keep you comfortable while you work, letting your creative juices flow freely. With intuitive and automatic adjustments that keep you focused, the vibrant and stylish Steelcase QiVi Chair will really enhance your office or conference area with a single chair annexation. The Steelcase QiVi Collaborative Chair is available with standard upholstery or upgraded sewn upholstery. The upgraded sewn upholstery features a stitched seam detail around the seat of the chair. Your Steelcase QiVi Chair will come standard with a plastic base to match your frame color, or you can upgrade to a polished aluminum base. Choose one of three different color options for the frame of your chair: black, arctic white, or platinum metallic. Choose from a wide variety of colors for your Steelcase QiVi Chair backrest. The backrest fabric is Steelcase Connect Net, which is a breathable material available in fun colors to match the seat of your chair. You can order your Steelcase QiVi Chair with or without arms. Choose from two different seat options, a fixed seat or a gliding seat. We recommend the gliding seat, which automatically moves up to 1'' forward and back as you move. You can choose from two different types of casters for your Steelcase QiVi Chair, carpet or hard floor casters. Standard hard casters roll easily on carpet floors while hard casters work better for hard floors because they won't roll as easily when you get up from your chair. $551.00 List Price: $876.00* The list price is the same as the MSRP (Manufacturer's Suggested Retail Price). It may not necessarily be the price at which the product is sold.